Few creatures are as maligned or feared as the rat. There are of course good reasons for this. Rats in their feral state carry diseases, and historically it was the black rat entering Europe from the east that carried the Black Death that caused the death of a third of Europe's population in the fourteenth century. 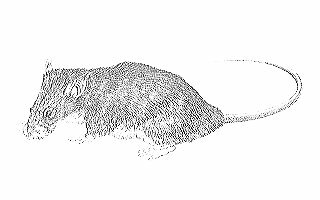 From time immemorial rats have been man's conspecifics, following him into his settlements and eating his standing foodstocks, boarding his ships and disembarking in strange lands to wreak havoc on the native ecology. It may be no coincidence that the cobra came to be revered in lands which in ancient times had much to lose from the depredations of the rat, namely India and Ancient Egypt. Today London's sewers are purportedly full of rats, so that anywhere in London you are apparently no more than four hundred yards away from a rat. One book luridly described the possibility of a new plague arising from this new generation of urban rodents. Yet even the most confirmed ratophobe cannot deny the rat's virtues: its toughness, its tenacity and perhaps above all its intelligence. Rats are among the most intelligent of animals, and ironically among the most affectionate of rodents. It only takes a little training for a rat to sit on its owner's shoulder or find its way through a maze to collect the reward. This in some ways is the more surprising because a rat's eyesight is not good: like their old protagonist the snake, they rely much more on the senses of smell and touch, or the perception of vibration. As pets they develop individual personalities. Rats are an ideal mammal pet for many people. They take up little space, requiring only a moderately-sized cage which will fit into the smallest of flats or houses. They eat a handful of food, mostly dry grains, per day, and can drink from a water bottle. They can learn to play or just to sit with you in quiet contentment. For rodents they are moderately long-lived, usually reaching three or four years of age. They are rarely vicious. 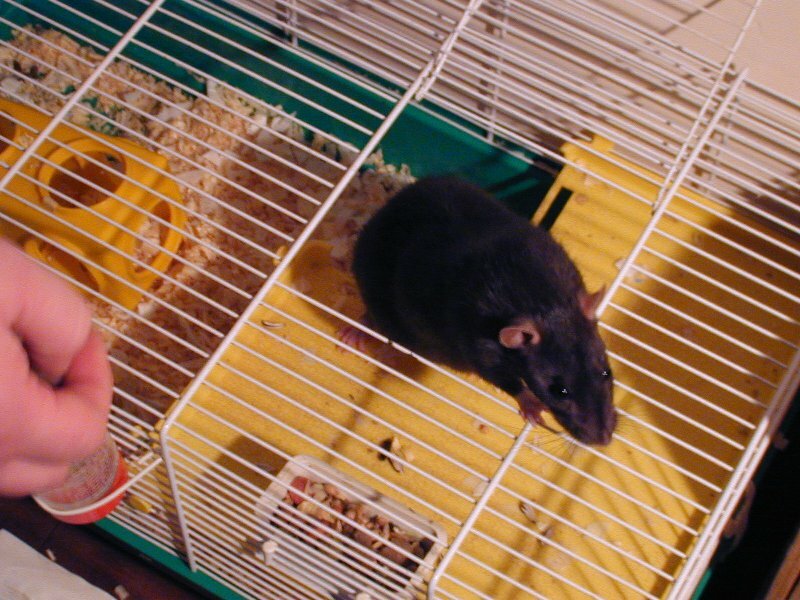 There are a few precautions you should observe with pet rats. Firstly, until they are used to you, never hold them too close to your face. Remember, their eyesight is not good and you don't want to be bitten or scratched in this area. If a rat does decide to bite (usually through fear or anger), their sharp incisors can leave a deep gash and cause bleeding. Secondly (speaking through experience here), keep an eye on them if you let them out of the cage. It is good to let them run around the room and have some exercise, but make sure they don't disappear out of sight for long or you may find your furniture has been gnawed. Also, my wife lost a silk scarf which she left out near a rat cage - it was found weeks later as the tatty lining for their plastic igloo. Obviously, there are some pets that are not compatible. Some dogs, especially the "ratting" or hunting types, will attack rats, and any cat with an ounce of energy will usually be antagonistic towards a rat. Also, carnivorous reptiles (certainly all snakes and such lizards as monitors) prey in the wild on rats, so keep these out of sight and smell. In particular pythons can become dangerously excited by the smell of a rodent dinner. Rats are best obtained from existing captive stock, ie from a pet shop or from another owner's collection. Having said that, we obtained three of our rats from an animal sanctuary (they had been given up by their previous owners whose circumstances had changed), and they have all been fine. It is unadvisable to take a rat from the wild for obvious reasons (disease, parasites and the possibility of a bad temperament), and in any case you might be taking a very old rat which might die within a short time. As pets go rats are very cheap themselves (never more than five or at most ten pounds), but you will probably pay another � for the cage, water bottle and food bowl. You will also need a bag of bedding to put down in the cage - this is usually shavings or some other wood-based product that is not expensive. A wheel is also nice, although not all rats will use one. After that a bag of rat food will last several days and cost you no more than �3. Maintenance of the rat is quite simple and involves cleaning the cage out as soon as the bedding appears to be damp or dirty, scrubbing the cage with an animal-friendly disinfectant (pet shops can usually supply this) and drying it and placing fresh bedding back in. Apart from the food once a day, fresh water should be provided daily, or at least on a regular basis. A bowl can be used in place of a water bottle, but has the disadvantage that rats (like some reptiles) tend to defecate in the water, or sometimes knock it over. Rats can live together, and we house two of our females in one cage. However, as with most animals, males tend to be territorial and may fight. Also, as rats have personalities, not all of them will get on together, especially if one is used to being the established rat: our oldest rat, Whisper, would attack the other two female rats who followed her. As rat fighting is quite vicious, this is a situation that you want to avoid. Rats, like most rodents, are also quite fertile, so you should think twice about housing males and females together. A rat can produce several litters, each containing several pups, per year, so your chances of rehousing all your rat young are limited. In any case, it is not advisable to give babies away unless you want to have them humanely killed to provide food for other animals (especially reptiles) - most people, even confirmed herp-lovers like me, would hesitate at this. You then end up with adult rats jostling with a crowd of young rats in a cage, which doesn't do any of them any good. If you must breed rats (and there are those who are seriously interested in rats enough to do so, eg members of the Fancy Rat Society), make sure before you put the prospective parents together that you have homes for them all to go to. Some people may wonder why a snake- and lizard-keeper like me doesn't keep breeding rats with a view to having a cheap and regular supply of food for his reptiles. The answer, as John Breen correctly stated, is that rats do develop such personality and often affection that a tender-hearted person finds it hard to kill one pet to feed to another. Call it late twentieth-century sentimentality, but it's a fact. It's also a fact that the rules governing the humane killing of live food are quite strict. The suggested method is the use of dried carbon dioxide or similar, something that most of us don't have ready access to. In this country it is also against the law to needlessly feed a live rat to a python or monitor: apart from moral questions, it is quite unnecessary (snakes and lizards usually will go for a dead rat as quickly as a live one), and a frightened or angry rat can endanger the life or health of your pet reptile. Rats have killed snakes in particular in such circumstances, so do the right thing and don't do it. Enjoy your pet rats and buy whatever else you need from the fridge at the pet shop.